USC made its final preparations Thursday for its week three matchup against Syracuse, and the UCLA colored scout team jerseys came out. Though this practice did not look much different from most mid-morning sessions, there was one key difference: scrimmaging in the red-zone. 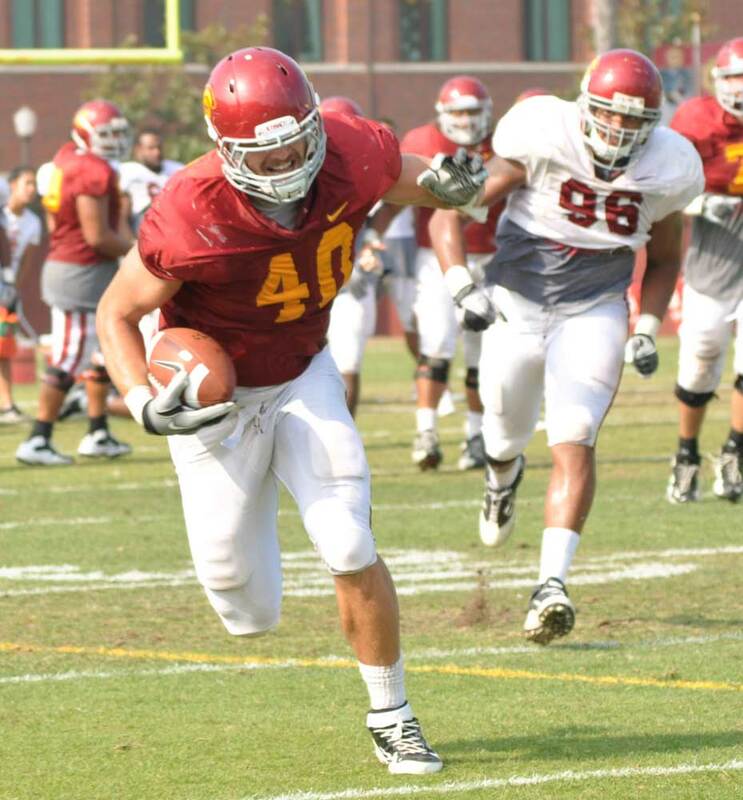 Rather than holding a full-field scrimmage, the Trojans opted to focus on attacking and defending inside the 20-yard line, something that senior fullback/tight end Rhett Ellison knows lacked in last week’s nail-biting win against Utah. Ellison is not worried about the state of the offense like many critics are, though. Ellison remains optimistic partly because of the return of senior tailback Marc Tyler, who ran for 113 yards in last week’s effort. Coming into the season, there was much speculation as to how the defense would perform this year. With two game-saving plays in the first two games — both in the fourth quarter — the unit will now face a tough test in Syracuse, but will face a bigger test in Tempe, Ariz. next week against Arizona State. “The defense needs to keep playing awesome,” Ellison said. This week during practice, USC coach Lane Kiffin has constantly stressed the team needs to worry about themselves, not about any other distractions. A new quarterback has been added to the roster. Junior Emon Saee is donning No. 17 in practice and is back on the team after not being on the roster during the preseason. He was also on the team last year.